See You All In Soulville! 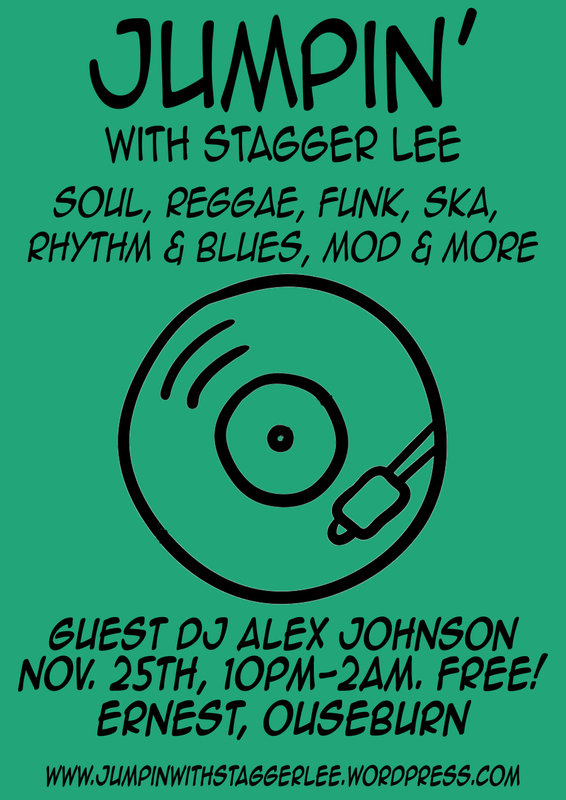 Seems like ages since the last Jumpin’ With Stagger Lee but we’re back on November 25th with a stack of new tunes. Joining us again is Alex Johnson, who absolutely killed it last time, and we’re sure this will be a big one. So join us down at Ernest in a couple of weeks and let’s have a blast! A host of DJs, a lot of general wonderfulness in a fantastic Ouseburn venue. All for a mere fiver in advance. For all your end of year soul-funk-mod-boogaloo-R&B-latin-rockabilly-garage-rocksteady-afrobeat needs! All vinyl, all awesome, all night. Just a heads up that I’m going to be hosting a stall AND DJing at Rumble in The Jumble down at the lovely Prohibition Bar in Gateshead this Sunday afternoon. I’m going to be selling literally hundreds of records, CDs, DVDs, books, comics, tshirts, belt buckles and such, at often knockdown prices. The CDs are from when I used them to DJ so I have hundreds of soul, R&B, country, blues, garage, rockabilly and jazz CDs. They’re mostly in plastic wallets rather than their cases, and many don’t have their sleeves, which is why I’m selling them for £1-2! So come down to Prohibition, buy some stuff, drink some booze, meet good folks. Sorted.